Wedding PR: PopSugar, WeddingIQ, Wall Street Journal and more! Another week means another amazing roundup of client features, including PopSugar, WeddingIQ, Wall Street Journal and so many more! Keep scrolling to see more. Mike B Photography, Destination Weddings, International Academy of Wedding & Event Planning, Belladeux Event Design, Cocoon Events Management Group, Jenny DeMarco Photography, Rochelle Cheever Photography and Wente Vineyards were featured on PopSugar in the article, Under-the-Radar Destination Wedding Locations for 2017. Check out the full feature here. 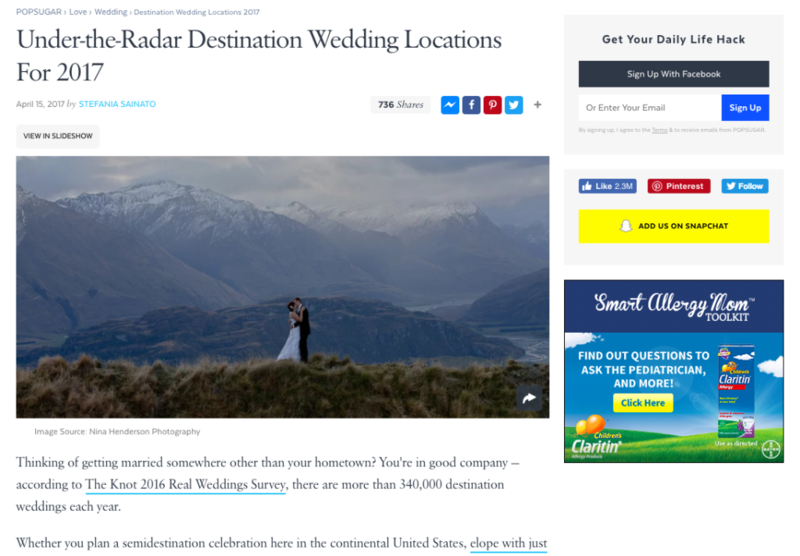 OFD Consulting was featured on WeddingWire EDU with her guest article, 4 Easy Steps to Content Creation as a Wedding Pro. See the full article here. Belladeux Event Design was featured on WeddingIQ with her guest article, How to Create a Destination Event at Home. See her full article here. Destination Weddings Travel Group was featured on Caribbean Bride with the real wedding, Marisa and Suresh, Aruba. See the wedding in its entirety here. Belladeux Event Design was featured on Catersource with her guest article, The Hidden Cost of Backyard Events. See the full article here. Sunshower Photography was featured on How He Asked with the proposal, Risa and Austin. See the full feature here. Cocoon Events Management Group was featured in the Wall Street Journal in the article, Small Weddings, Big Budgets. See the full article here. Kylie Carlson of International Academy for Wedding & Event Planning was featured in the True Trae article, Beauty Secrets-Kylie Carlson. See the full feature here. Cocoon Events Management Group, Jacqueline Events & Design, Belladeux Event Design, and Fantasy Sound Event Services was featured on Brides.com in the article, What to Do When You’re Feeling Totally Over Wedding Planning. See the full feature here. 100 Candles was featured on Catersource with their guest article, Spring Lighting Trends. See the full article here.